« Apple iPhone Coming To Singapore On 22 August! 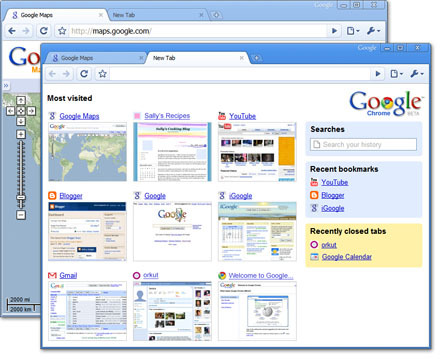 In case you still have not noticed, Google had entered the web browser market by releasing their first ever web browser, Google Chrome, yesterday. I’m always excited whenever Google launches any software, therefore I’ve installed Google Chrome immediately after reading this fascinating news yesterday even though the software is still under Beta version. Well, what makes Google Chrome different from other web browsers? Such feature could significantly prevent one tab from crashing another. For browser like Internet Explorer or Firefox, there is a tendency the whole browser will crash just because of one memory-hogging bug on one website. You won’t see such crashing happens to Google Chrome. In fact, you can even use its own built-in Task Manager to kill the misbehaving tab individually when you need to. When a browsing tab is closed in Google Chrome, the whole process is ended. As simple as that! There won’t be any used memory left uncollected by the Operating System. In other words, no memory will be wasted when you run Google Chrome. This is another cool feature that I love. While you are in incognito browsing mode, websites that you surf or files downloaded won’t be recorded in your browsing and download histories. Besides, all new cookies will be deleted the incognito window is closed. In short, Incognito Browsing leaves no trace to where you browse. No, not create an application shortcut of Google Chrome in your Windows. In Google Chrome, there is a feature where you can create a shortcut of a website and save it to either Desktop, Start Menu and Quick Launch Bar. Yes, only 3 locations available at the moment. These shortcuts will run Google Chrome and open the website, even Google Chrome is not the default web browser. Well, I like it as an alternative browser, as it’s clean, fast, no-nonsense, crash-proof and modern. Will Google Chrome replaces other browsers? I don’t think so because it still lacks of important things like plugins. I can’t even install Google Toolbar on it, which I think should be the default toolbar for Google Chrome. Another reason is that Google Chrome is currently only available for Windows XP with Service Pack 2 or later and Windows Vista only. Mac and Linux users may sign up for email notification regarding the compatible version though. Thanks for the review of Google Chrome. I will also follow the development closely. Especially I can recommend that all webmasters try to take a look on how Google Chrome is displaying their websites. What about colors, what about tables, what about how videos are being shown etc etc. – Clever and useful innovations are always appreciated.